This is Joe Sheehan’s’s second piece as part of his April residency at FanGraphs. A founding member of Baseball Prospectus, Joe currently publishes an eponymous Baseball Newsletter. You can find him on Twitter, as well. Read all our residency posts here. Two pieces ran at FanGraphs earlier this week that addressed critical issues facing Major League Baseball. Dave Cameron pointed out that, with walk rates ticking back up in the season’s early days, that the Three True Outcomes (walks, strikeouts, home runs) accounted for over a third of all plate appearances. Jeff Sullivan then wrote that early-season games were averaging a snappy 3:11, with lag time between pitches jumping by more than a second. Scores of smart people have taken aim at both issues raised by the Wonder Twins of FanGraphs. Pace of play has replaced PEDs as Baseball’s Big Issue. What I’m not sure we’ve discussed sufficiently is how those two things — TTO baseball and lag time between pitches — are correlated, and how the style of baseball being played in 2017 directly affects the pace at which baseball is being played in 2017. Let’s back up. Baseball, as evolved from various stick-and-ball games in the 19th century, was originally a contest in which the pitcher’s role was similar to that of a slow-pitch softball hurler. His job was to kick things off by offering up a ball that the batter could whack into the field of play, where the real business of playing baseball happened: running and throwing and fielding and even throwing the ball at a baserunner to record an out. The pitcher was the least important player on the field in the game’s early days. There were, in fact, no mechanisms to force the pitcher to give the batter hittable pitches; it was just considered his job to do so. Batters were even able to request high or low pitches, the better to fit their swing. 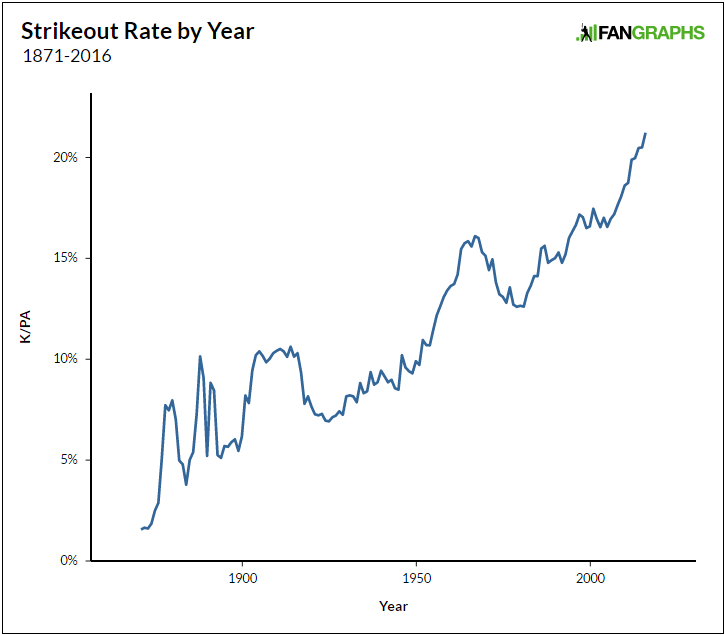 It’s not a perfectly clean line, as the deadball era saw a jump in whiffs that disappeared during World War I, but the long-term trend is clear: strikeout rates have risen throughout baseball history, and you can trace it all back to 1884, when baseball turned pitchers into the most important players in the game. So now, 133 years later, in a 7-1 game in the ninth, you have to watch some 27-year-old failed starter huff and puff for 23 seconds, catching his breath while deciding between his fastball and his fastball, all because Pud Galvin and his ilk cheated so effectively that the game gave up trying to stop them. This is Joe Sheehan’s first piece as part of his April residency at FanGraphs. A founding member of Baseball Prospectus, Joe currently publishes an eponymous Baseball Newsletter. You can find him on Twitter, as well. This is what it’s like being a baseball fan in 2017. The issues you face are ones of reconciling changes in how the velocity of every single pitch thrown in MLB is tracked. It’s not about getting that data, but rather, about sussing out the difference between measurement points of the pitch on the way from the pitcher’s hand to home plate. We had a different set of problems when we were putting together the first Baseball Prospectus annual, back in the winter of 1995-96. The challenges we faced weren’t discerning which measure of velocity to use, but rather, when we would get access to minor-league statistics, and how soon lefty/righty splits would be in our hands, and would anyone at all talk to us about prospects we only knew by their stat lines.